Welcome to the Sandia Band Boosters! We are parents and family members working together to support our students in achieving their passion and goals in music and in life. 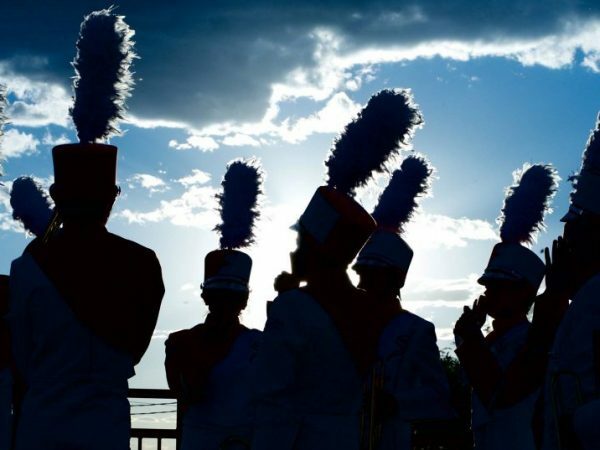 Your student is about to embark on many amazing opportunities and adventures in their musical and personal growth in Sandia High School’s Band program. Your student may be in one or several of the various bands in the band program and Mr. North has exciting curriculums planned for each and every one of the bands! As you may or may not already know, music education is an expensive course of study and most of what is needed is not covered by APS, but what the students get in return in their musical and personal growth is invaluable. This is where families come in; under the Sandia Band Boosters, we all work together to make sure the funds and helping hands are there for our students to aim high and reach their full potential! The Band Booster Board works with Mr. North to establish a yearly budget and work hard throughout the year to make sure the band program is fully funded. Included in the budget is purchasing music scores and rights, instruments (new, repair, replace, rentals), hiring music clinicians, uniforms (dry cleaning, shoes, show shirts, etc…), transportation (school buses and Penske trucks), competition entry fees, performance rental spaces, supplies, meals and snack and the list goes on… We are anticipating $80,000 in expenses this year for all six bands! To keep costs as low as possible for everyone, all the families work together. At the beginning of the year, lab fees and booster expenses are collected to get the program started. This can be anywhere from $125 to $365 dollars depending on which and how many bands your student is enrolled. Then throughout the year we have several fundraisers that we all volunteer at to raise the rest of the needed funds. One last thing, we know we are asking for some what many of us have little of: time and money. But remember it is going to our greatest cause; our children. The great thing about volunteering for the band program, whether it be fundraising or road crew, is actually being present alongside your student and watching them grow right before your eyes; from fledgling freshmen to young adults their Senior year. Please keep in mind when the call for volunteers goes out; YOU are needed, YOU are appreciated, and YOUR influence will leave an unfathomable impact on the lives of our students. It’s going to be a great year! Go Matadors! I am a graduate of Eldorado High School and received my BA in Criminal Justice from New Mexico State University. My daughter is a Sandia High School Alum who spent four years with the Marching Band Color Guard and Winter Guard. She is a first year student at UNM. My son is a current Sandia Concert Band member in his junior year. I am a Global Event Specialist for Sandia National Laboratories and an active fundraiser for the University of New Mexico Children’s Hospital.